If your little one takes their parenting responsibilities seriously, they'll love this awesome 'Time To Eat' Feeding Set from our friends at Melissa & Doug. With an easy-close embroidered bib, a divided dish, a fork, a spoon and yummy "apple sauce" and "peas and carrots" baby foods all included, meal times are sure to be both clean and nourishing - and if baby just wont take to solids, there's always the disappearing "orange juice" and "milk" bottles to make sure she's had her daily nutrition! 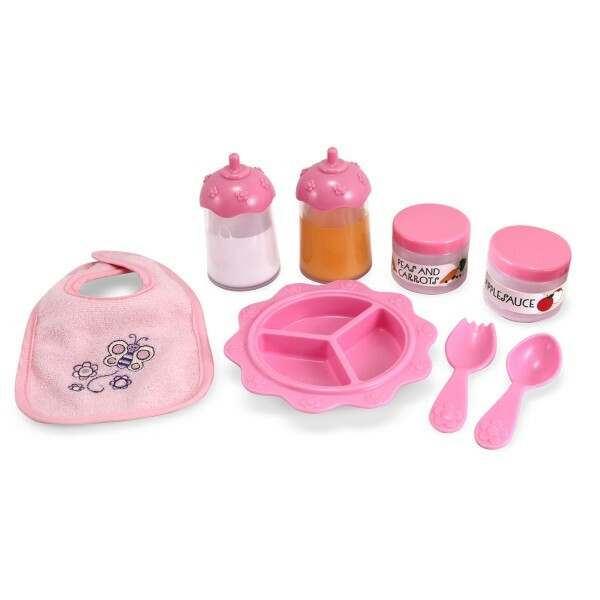 With eight fun pieces, this is a set that any little parent who loves their doll is sure to adore - we just wish meal times at our house were so easy and fun! A great accompaniment to Melissa & Doug's doll sets, with all the accessories fitting the dolls in the range perfectly. The milk and the orange juice in the bottles really does disappear when tipped up, so you're guaranteed some 'wow' moments. Encouraging children to look after a doll is a great way to help them get used to having a new brother or sister. All Melissa & Doug products meet or exceed European safety standards.